Adventism has wrestled with the concept of human perfection almost from its beginnings. The subject has always been controversial –is it possible or not? Some conservative Adventists believe it is achievable, while other, likely more liberal Adventists, doubt it. It seems, at least in my experience, that the investigative approach to this question also differs depending on whether one considers themselves conservative or liberal. Conservative proponents have proposed arguments in favor based on their understanding of both the Bible and Spirit of Prophecy. Liberals often question whether human perfection can actually work in practice. My view is that both perspectives are necessary to reach sound conclusions. It’s like a road with a ditch on either side. On the one hand we humans operate from a very limited perspective and have, at minimum, sinful tendencies. But God’s communication ostensibly exists in part to lead us into better choices and needs to be taken normatively. Deprecation of revelatory information might be termed the left-side ditch. On the other hand, people too often exegete into interpretations that can be quite faulty when logic and one’s own internal moral compass are denigrated. This is the right-side ditch. When scripture and an intuitive sense of rightness sync, the chances of proceeding as God wills are better than when one voice or the other is ignored. This, I suggest, is the roadway. In recent years the pro perfection viewpoint has been promulgated by some Adventists under the label of Last Generation Theology. This label encompasses eschatology, the purpose for Adventism and the possibility of sinlessness. As I have studied LGT some of its conclusions seem reasonable, some do not. Now I suspect an LGT proponent might believe that using reasonableness as a consideration is simply inappropriate. When the exegesis is finished there is nothing further to consider! But this perspective ignores the possibility of veering into the right-side ditch. At minimum, if the conclusions reached by a theological position seem intuitively problematic – regardless of the presumed exegetical soundness – then one should pause and try to answer those concerns. Examining these right-ditch issues will be the focus of this article. I’ll now detail some of the concerns I have with these positions. This will serve to illuminate the core issue I wish to subsequently focus on – moral complexity. Larry Kirkpatrick proposes: “The reason that the Seventh-day Adventist Church exists is to prepare people for translation”. I find this disturbing. Where is the Great Commission? Is Adventism a “post-graduate” institution for people already Christianized? LGT seemingly justifies this because “God will wait for the maturing Christian character in a significant number of people as the chief condition determining” the Second Coming. So unless enough people achieve perfection the Second Coming will be delayed. Since the statements used to develop this doctrine generally predate the Twentieth Century one could conclude that all the misery of the last 100+ years – like the Holocaust, Stalinist Gulag and Khmer Rouge genocide – is a consequence of Adventist moral failure. Quite a burden. Kevin Paulson states: “The reason God can’t take any but overcomers to heaven is because He must be sure those He takes won’t start another revolution.” This sounds plausible, but everything hinges on how the word “overcomer” is to be defined. I will get to that shortly. But what is God’s purpose in requiring some “significant number” being alive simultaneously as a prerequisite for the Second Coming? And what amount is significant enough? If whatever it means to be an overcomer is the consistent prerequisite for salvation, then this criterion would be true throughout history. And heaven would still be safe no matter when those people were alive. So why this “significant number” now? It had better be important, because there will be a large amount of extra misery added to the grand total for each day delayed! One possible reason for needing a “significant number” would be to show how God’s message is making headway in the world, with more people overcoming sin. So much so that God has adequately demonstrated people can be perfect and the Second Coming can occur. But, not everyone has had the same opportunities in life. Some are born into very bad families. They can be deformed or diseased. Their social environments can be informationally and/or morally deficient. Their mental abilities can vary from retarded to Mensa-level. And across history and cultures people have had widely varying access to God’s principles. Millions have lived and died without ever hearing anything remotely like the gospel message. This would make the “significant number” criterion more problematic as world population has increased and now has better access to God’s principles via communication and improved social conditions. Such improvements could make overcoming easier and thus demonstrate nothing. Would 100,000 overcomers today be more significant than 10,000 during the Middle Ages? Perhaps not. Quantity is only one parameter. One also has to consider % of total population, amount of God-knowledge in the environment, etc. Also, how do we reconcile this inequity with a fair God who does not wish anyone to perish? It makes sense if the salvation criterion is simply a ‘heart cry’ of desire to follow God (even when ‘God’ is far from being recognized as Christian). That is a lot fairer and more accessible across the scope of mankind than having to be sinless in the face of such disparate circumstances. If perfection (however defined) is mandatory for salvation and/or there is need to have sufficient numbers of perfect people before Jesus will return then it seems to me there will be a tendency for these aspirants to avoid taking risks. Interacting with sinful humanity can contaminate. If you work with difficult people and in difficult situations the surrounding environment puts you more at risk of sinning. If sin avoidance is the primary goal, then “go ye into all the world” (including some very nasty environments) is an inconsistent and dangerous command. Wouldn’t believers choose to focus inward rather than outward? I question whether a Christian has much assurance under this theology. And one ought to then ask what this says about God’s fairness. We are born into this world fairly clueless about our duty and prospects for life after death. And the world, throughout history, has been a very unequal living environment, as detailed above. Yet LGT says we are one sin away (however sin is defined) from losing salvation. What kind of God would put such a squeeze on people? Regarding surrender, Kevin Paulson believes “Obviously we can know if in fact we are, or are not, holding anything back from God”. But that seems anything but obvious to me. Yes, the choices are clear in many situations – if I cheat on my wife or embezzle, for example. 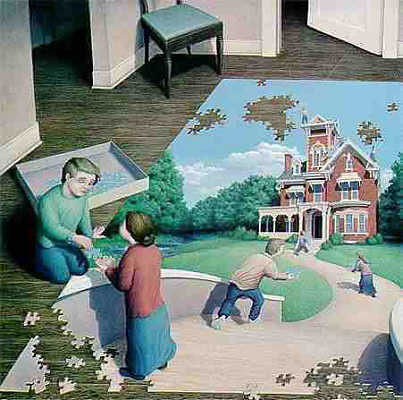 But there are many other situations that are subtle and ambiguous. In these areas one might not be sure if the surrender is complete. Here then is a major cause of insecurity if one accepts this theology. Especially for sensitive and introspective people. Thus getting a clear handle on what is or is not sin becomes central to the issue of security. And to that subject I now turn. Salvation is binary – you’re either in or you’re out. And if LGT is correct, one unrepented sin disqualifies us. If sin can be clearly, unambiguously defined, at least we would be able to correctly assess our situation. So I would hope that LGT literature would help us out – since clarity here is crucial. One of my three references, above, is Dennis Priebe’s Face to Face With the Real Gospel. It is not web-accessible, unfortunately, and probably is also out-of-print. But Priebe has a chapter titled “What is Sin?” Obviously this seems to be a fruitful place to look for answers. However, in reading the chapter, I discovered that Priebe does not answer the title question at all. His burden, instead, is to prove that Original Sin is unbiblical. And to that end he makes some good points. But answering that is, at best, telling us what sin is not rather than what it is. Priebe aside, I have never read anywhere an unambiguous definition of sin and frankly doubt it is possible. What one usually finds is that sin is defined as “the transgression of the law”. But this is far from unambiguous. How deeply do we define “law” – especially considering how Jesus included lust as a breaking of the 7th commandment? Here we move from act to thought. Also clearly defining “transgression” can be difficult to impossible. However, I suggest this is just the tip of the complexity iceberg. We live in a world where sin is being committed all around. And perpetrators frequently get off scot-free. This environment is a far cry from Eden or some unfallen world. Here we often have situations that necessarily result in moral tradeoffs. You are a believing Christian living in Nazi Germany in the 1940s. Some Jews on the run from the Gestapo have come to you for help and you have hidden them in your barn. Later the Gestapo agents knock on your door and ask you directly: ‘Are there any Jews on your property?’ How should you answer them? The core of all such problems is a no-win environment – in this example: lying vs. the potential of everyone being imprisoned and likely killed. And the underlying reason for the dilemma is that the world is not completely moral. Thus we are often presented with choices (sometimes trivial, of course) that make it difficult or impossible to avoid moral prioritizing. The inner sphere represents situations where there is no moral conflict and thus a situational decision has no ambiguity. That is, some decisions we face have a clear moral alternative. This can and does happen here but would always occur in an unfallen world. 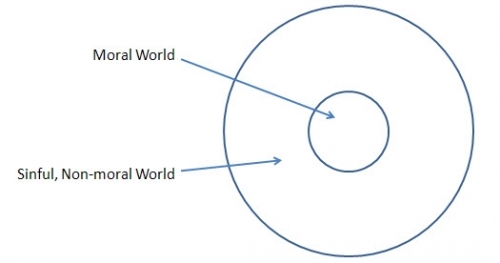 The outer sphere represents situations found in a fallen world where the existence of evil forces people into dilemmas with complex moral alternatives. Kane formulates a principle for such situations that involves trying to determine what the most moral alternative is and then choosing that one. In the “Jews” example, the tradeoff is between commandment 8 (lying) and commandment 5 (killing). The dilemma is whether to choose to lie based on only the probability that telling the truth to the Gestapo would result in killing. One would presumably only lie because you perceived – with incomplete information – that it was the most moral option. 1) No definition is fully unambiguous, thus there is always a significant amount of personal interpretation that must take place when the situation is morally complex, and none of us have a ‘God’s-eye view’ with which to evaluate consequences. 2) Some situations force us to decide whether the immediate moral choice (e.g. lying in the ‘Jews’ example) is correct, or whether such a decision is less moral because of bad subsequent consequences (the expected arrests and killing). These ‘lose-lose’ scenarios are a consequence of a sinful world and occur with regularity in peoples’ lives – albeit mostly with much lower stakes than the ‘Jews’ example. Some months ago a reader on this website commented: “Can we really live a blameless life in a blame-filled society? I think not, and for that reason I cannot agree with final generation perfection.” Our inability to be certain how to proceed in the face of these real, complex and ambiguous moral dilemmas is, I suggest, the bedrock flaw in LGT. The solution is to seek understanding of, then alignment with, God’s view of the most moral choices. We will then act imperfectly but with the best of intention. Perhaps an LGT adherent would say that such choices consequently are sinless. But I doubt it. My ‘right-ditch’ assessment of LGT is that it has an overly-simplistic conception of what a sinful earth is really like. I have tried to provide quotes that accurately reflect the LGT position and I would encourage all readers to examine the underlying material to judge for themselves. Using the word ‘ambiguous’ in no way implies moral relativism. There can be absolute right and wrong (which I believe is the case) yet people can be unsure what choice is best. "Ye have heard that it was said by them of old time, Thou shalt not commit adultery: But I say unto you, That whosoever looketh on a woman to lust after her hath committed adultery with her already in his heart." Matt. 5: 27-28. Consider: http://theosophical.wordpress.com/2009/06/09/when-lying-is-not-wrong/ and http://blackbirdpress.org/philosophy-2/are-there-moral-laws. The second link explores this problem more generally and thoroughly than I am able in this space-constrained context. Also this category of moral dilemma was explored by two Adventists – Roy Adams: Adventist Review, December 1997, pp. 24-26 and Ron DuPreez: Journal of the Adventist Theological Society, Spring 1998, pp. 187-219. http://www.atsjats.org/publication_file.php?pub_id=175&journal=1&type=pdf. They strongly disagreed with each other! Kane, Robert, Through the Moral Maze (Paragon House, 1994). There may still, however, be difficulty if the decider, because of insufficient information, cannot determine the best choice. This approach may seem to some like a pure cop-out. But Jesus understood the problem of moral complexity. See Mark 2:23-26.